In addition to being joint Music Director of Cantate, Nicholas Shaw is Youth Chorus Master at Opera North (England’s national opera company in the North) and Organist and Director of Chapel Music at Lincoln’s Inn in London. He first experienced Cantate on a wet afternoon in Harlow when he realised that his background in cathedral music was going to be of little use to the fast-paced and varied music that Cantate has always been known for. Happily he managed to convince people that he was a quick learner and he spent 7 years as assistant music director and accompanist to the choir, playing piano for many important milestones in the choir’s history. Appointed joint music director in 2010, Nicholas has strived to continue the Cantate mission that good music and good music making should be available to all, and every child is capable of extraordinary things given a good and supportive environment in which to work. Nick’s belief in music as a vital part of education goes way beyond the choir. He is a passionate advocate of the importance of a decent music education for all young people and pursues a diverse career than includes leading singing for infant aged children to teaching choral conducting at Cambridge University via workshops and classroom engagement with pupils of all ages and abilities. As Youth Chorus Master at Opera North he works with students from all over the North of England preparing them for work on the main stage of Opera North as well as in a busy season of projects from their base in Leeds. 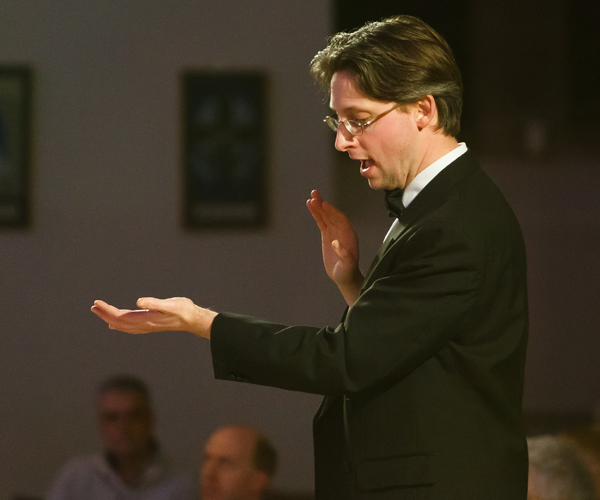 As a choral director he has devised and led projects for Sing up and Aldeburgh Music and works with an open access choir at Saffron Walden County High School for a project suggested by Gabrieli. For over ten years he was Director of Choirs at Junior Guildhall. In the last few years his choirs have performed in the Royal Albert Hall, the Royal Festival Hall, St Albans, Southwark and Ely Cathedrals, Saffron Hall as well as at venues around Cantate’s base in Bishops Stortford. His background in church music has never completely been forgotten, and although his organ recital days are probably over, Nicholas is Organist and Director of Chapel Music at Lincoln’s Inn in London where he conducts the professional choir in services and concerts. He is curating a project of substantial new choral works celebrating both the 400th anniversary of the Chapel and the Inn’s most famous Preacher, John Donne, making use of the fantastic choir and the new organ that he commissioned in 2009. Nicholas trained at Oxford (as organ scholar of Magdalen College) and at the Royal Academy of Music where he was one of the founding students on the choral conducting course. He was made an Associate of the Academy in 2012.